today during naptime we moved sam's bed and rearranged the furniture in the spare room so that it's now officially sam's room. luckily everything seemed to fit just the way i'd imagined it, so it didn't take long to get it all into place. the only things left to do are finish up his new artwork for his frames and hang them, and then figure out how we're going to handle the lack of bookshelves. 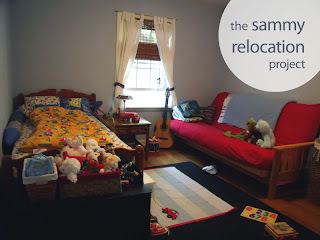 right now all of sam's books are still in his old room, which is fine for the time being, but i think sam ought to have some book storage of his own. since floor space is at a premium (even in the "big" room), i was thinking something like this or this to hang over the futon, though maybe that doesn't put them well enough within reach. i also thought something like this would be super clever (and cute!) i guess we'll just have to see what we can come up with. i am currently wishing that the rest of the house was as put together looking as sam's new room, because it is most certainly NOT. in the meantime, we still have another room to tackle, and it's in a state of real wreckage (even worse than most of the rest of the house, if you can believe it). it has become the storage area for all that is waiting for the little lady to appear, and none of it (except for the lovely labeled bins of clothing from aunt missy) is organized whatsoever. i have a feeling that the fresh coat of paint and this new rug will help put it in a more pleasing light. i've got new curtains on my mind, and some ideas for a bit of artwork for her walls. i'm also thinking about testing my spray-painting skills. of course, i'll have to find the time to fit in all the craftiness that is on my to-do list, which means i really ought to get off the computer and tend to the project at hand.